This shows half of my classroom library (the other half is a mirror image). My father and I built the shelving unit and I painted it using very "kid friendly" colors. The books have all been separated by subject or theme (Curious George, Franklin, Dr. Seuss, Nonfiction, Animals, Junie B., Chapter Books, etc.) Each area on the shelves is marked with a tag which states the name of the category and also has a colored dot. The color of the dot is unique for that specific category, and all of the books are also marked with this same color. 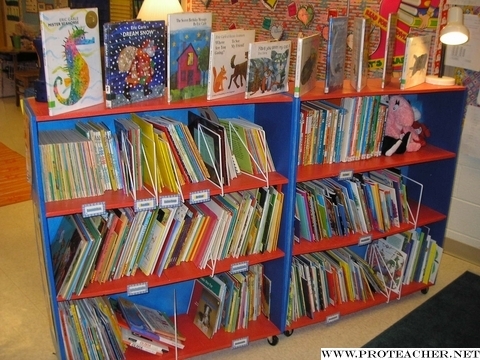 Students are free to choose a book from any of the categories, and when they need to put the books away, they simply match the colored dots from the books to the section on the shelves. The sections are divided with shelf dividers that are easily moveable to accommodate my growing library. All of the books in my classroom library are available to my students and are located in an easy to reach area. Students often choose to curl up on the carpet in front of the shelves and enjoy a good book. Because it is very easy for the students to locate a book of interest to them, all of my students have become enthusiastic about reading. After reading a book, students simply refer to the color dot inside the cover, and they know exactly where the book belongs. This system allows my students to read a book during transition times, and it helps to keep cleanup a snap! In addition to the bookshelves, my classroom library consists of two child sized chairs, a carpet, and reading lamps. As a first year teacher, I am very proud of my reading corner!